For those of you who recall the legends of King Arthur, the character “Mordred” was Arthur’s illegitimate son in the various variations. He was a shadowy trouble maker who lusted for power but because of his illegitimacy, was not in line to the throne, so his hatred and resentment boiled over into causing nothing but problems for Arthur and his kingdom. He instigated fights between the knights of the Round Table and generally caused things to become a shambles wherever he went, and with whatever he had a hand in. His very name seemed to be more appropriately broken down into “More Dread”. In the end, the kingdom collapsed into war. For similar reasons, over the last couple of years I’ve come to think of the Obama Administration and their Democrat allies in Congress, more as the “Mordred Administration”. Glenn Beck is the only one who’s exposed them. The rest of the media, outside of Fox News, seems to be in their back pockets, and to have abdicated their past role as the watch dogs of society, who were supposed to report the truth despite their personal political views, not turn into the propaganda machine they have. But these players appear to have allied together to become very effective gremlins, attacking our nation, our culture, our freedoms and our way of life itself. Beck even identified Marxist America-hating defrocked college professor Ward Churchill recently, at a violent rally in Arizona, over the teaching of a class that was indoctrinating students to hate the United States, claimed that Mexico rightfully owned the southwest part of our nation, and that white people were “racist oppressors” of the “poor exploited” people of color, all over the world. It appears that Glenn Beck, who has been correct a remarkable percentage of the time, has nailed this open conspiracy ( Not a “theory”, because it’s being done openly – he’s exposed it “in their own words” and deeds. ) and exposed it, yet nothing is really being done about it, and it’s proceeding on a fast track. In true Cloward Piven fashion, Obama even blew Congress off entirely and pursued an illegal war in Libya, now with actual boots on the ground, and without even honoring the War Powers Act, yet alone the constitutional requirement for Congress to declare war. But who will impeach him. Congress doesn’t even seem to care that their powers have been usurped by a wanna-be King. Yes, the whole thing just reeks of “Mordred” if you ask me, but the people remain complacent, when they should be screaming bloody murder about all this, in the streets. We even have the Federal Reserve, a private organization owned by who knows who, expanding and devaluing our money, as if they were a planned part of the “Mordred Conspiracy”. right now, to save the United States from an impending collapse, yet the Congress fiddles while America burns. They don’t even have to cut the more drastic things that have been suggested, like shutting down the Departments of Education, HUD and Energy. All they have to do is return to the Clinton budget, which was balanced. Yet they won’t. goalwas “merely” to collapse and globalize the United States, but what they will actually get, will likely be the complete collapse of the global economy. What then? The term “the […] hitting the fan” comes to mind. Will it end in Audrey Tomason’s “Apocalypse Equation” genocidal maniacal vision of a “limited nuclear conflict”, followed by chemical biological warfare, to get the global population down to a “sustainable” 1.5 billion, from where it’s going now? Brace yourself, because unless someone can wake the majority of sleeping, apathetic depressed and numb shell-shocked Americans up, I don’t think we have long now. This entry was posted in 2012 Election, Constitution, Economy, Education, Health Care, Media, United Nations and tagged Glenn Beck, United States. Bookmark the permalink. I have family members who think all is well, and I’m rabid. Mordred is an excellent comparison. Obama is worse than Mordred. 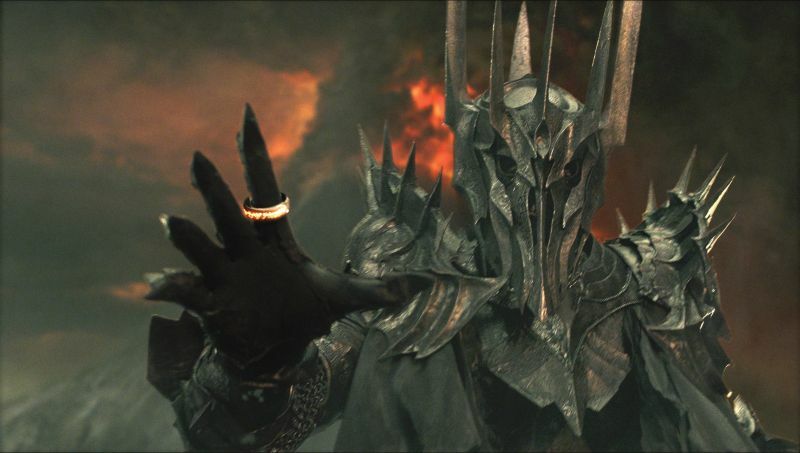 He’s Sauron.